This 4/20, get a doctor’s recommendation (medical marijuana card), cannabis delivered, and pizza all in 60 minutes without leaving your couch. Just order on Nugg and tell us what kind of pizza you want in the comments section! Picture this: it’s 4/20. Chances are you’ll be needing a pizza at some point. You just started thinking about pizza. The chance you’ll need a pizza today just increased 12,000%. Your friend Cindy just called and she wants to get really really stoned this 420 (obviously). Chances are you’ll now be needing anywhere from 2-10 pizzas. But what about the bud, the edibles, and the dabs Cindy called about that too. You’re in luck. You’re in luck. Why? Because this year, Nugg is spreading a LOT of 4/20 holiday cheer. And by cheer, we mean cannabis. AND pizza. That’s pizza and cannabis, together as one. But not just pizza and cannabis. FREE pizza and FREE cannabis! AND A FREE DOMINOS PIZZA WITH EVERY ORDER. Just tell us what kind of pizza you want in the comments section of your order! If you’re a new user, signup with the code PIZZA to get $20 off your first order. If you’re an existing user, just click the button below (or click here) to login and share Nugg with friends via email, Facebook, or Twitter. Not only that, but if you don’t have a doctor’s recommendation (marijuana card) for cannabis, which is required in California, you can get one online in about ten minutes through NuggMD. 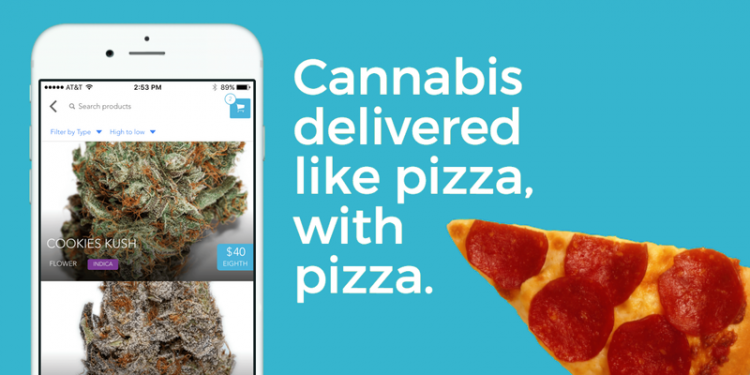 Just video-chat with a doctor then order marijuana delivery on Nugg instantly! You’re gosh darn right it’s mind-blowing. Order cannabis delivery on Nugg anywhere in California between now and midnight on 4/20. You’ll get $20 off your order when you signup with the code “PIZZA” (or the code FREEPIZZA if you already have an account) and a FREE medium PIZZA. Just don’t forget to get your friends in on this, they’ll love you for it and you can all eat pizza, watch Netflix, and consume the fine herb that is cannabis together!